This month, The Colour Run was well and truly kicked on in style as more than 17,500 runners of all ages, shapes and sizes took part in the returning event to cover the capital in colour. 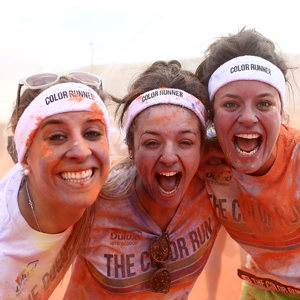 The Color Run went bigger, bolder and brighter in 2014, with runners taking to the streets of Wembley Park to jog, walk and dance their way around the 5k course. At each kilometre, participants were covered in powder explosions before DJs and MCs entertained the crowd at the Colour Festival Area, in an incredible party atmosphere of music and colour bursts. Known as the happiest 5k on the planet, The Color Run has no official times or winners. The focus is on healthiness, friendship and community spirit, and this shone through like the bright shade of yellow we were showered with at the 3k mark! Upon arrival, event village was extremely busy and we were advised before hand that the runners set off in waves to help manage the throughflow of runners. There was no bag drop, however luckily with the new London Designer Outlet literally next to the race start and finish, we were able to leave belongings in the car park and take any valuables in our waist bags. Setting off in the first wave, we enjoyed a clear run up to and around Wembley Stadium, before heading down towards the surrounding industrial area. Admittedly, it’s not a race to take part in for the views, but I guess it’s the compromise to being colour blasted! We joked that you would never be able to cover the streets of central London in a rainbow of powder paints, it just wouldn’t happen. It seemed to take ages to reach the first 1km, probably through excitement and anticipation, however once we had gone through the pink paint point, the rest seemed to come at us much quicker. By the time we reached the 2km blue point, we had sussed out the secret to getting covered - run through the arches cheering, right along the sides where the paint throwers are situated! I think the volunteers are advised to go hard on those showing more enthusiasm, as by the time we reached the orange 5km mark using this approach, we couldn’t see out of our glasses and looked a little oompa loompa like! Apart from a short uphill at the start, it was a nice flat course, designed for runners of all abilities. We saw people of all ages and group sizes, even mums and dads pushing little ones in pushchairs and prams, and apart from a couple of fast starters everyone seemed to take The Colour Run in their stride. In hindsight, we would have probably actually taken it a little slower to soak up the atmosphere at the paint points more, as this is certainly where all the fun happens. In between each kilometer the atmosphere did dip a little at times, maybe some live music on course would have helped, however you knew it would be long before the next colour blast so it wasn’t a major issue. With Wembley Stadium back in sight, we made our way to the finish line, high fiving all the spectators along the way, and into the Colour Festival Area. Upon finishing, we were given some small packs of paint to throw about as you please. We attempted to take a few of our own pictures jumping mid air in the paint, but failed miserably! Our advice would be to take your packets, and head to the music stage and join in with the organised colour bursts. This proved to be an extremely fun ending to a thoroughly enjoyable race. It felt like we were at a dance festival, we could have stuck around for hours. The Colour Run has paved the way for a new breed of running events that is exploding in popularity all around the world. This was not your typical group of runners, and it was apparent that enjoyment and encouraging participation at all levels was paramount. If it takes a splatter of paint to get more people active, surely that can only be a good thing. We shall definitely be back again next year! Following the success of the London event, The Color Run will soon visit Manchester (July 5th), Dublin (July 12th), Sunderland (July 20th), Birmingham (August 16th), Belfast (August 23rd) and Brighton (September 20th). 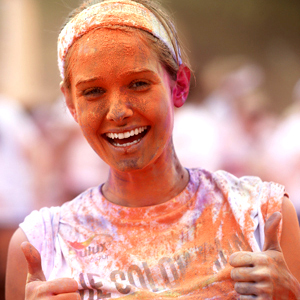 A limited number of places are still available for some events at www.TheColorRun.co.uk.